Robb Sutherland aka @changingworship is a chap I have had the privilege to get to know over the last year or so. Last week I had a blether with him for the podcast (something beautiful podcast) I co-host... and had a really fun time. Now... to be fair... we talked more about his role as an Anglican Priest... but his guitar playing did come up... so it made sense to feature him on my blog and ask him my wee interview. I greatly appreciate the responses Robb gave... and hope, one day, to hear his band, Silverthorn. I’m Robb and I am a priest working for the Church of England. I play in a band called Silverthorn – I’m the guitarist. We’re in the process of writing three songs. We started about six months ago writing new material and bits and pieces have come and gone but we’ve got some stuff that I found myself singing in the shower the other day. If I like it, it’ll do me. Depends on the day. I was inspired to pick up the guitar by Slash. I was 9 years old and my dad came home with a copy of Appetite for Destruction and it changed my life. 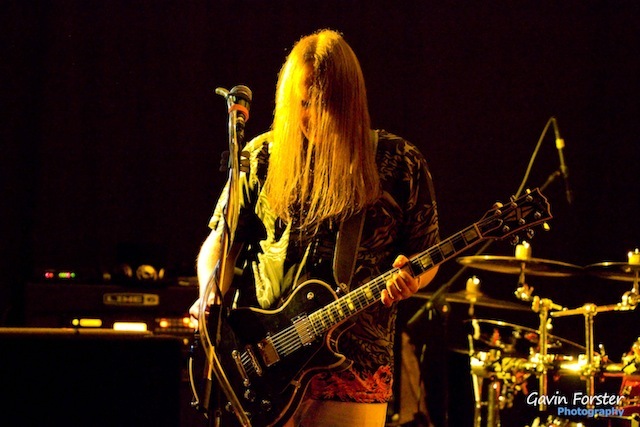 I’ve pretty much had long hair and a Les Paul ever since. The energy and raw power of that album is still amazing over two decades later! There are few debut albums that can become so internationally revered as Appetite. Shetland. It is so remote. The sky not quite getting dark in the height of summer. Guitar gadgets (he cheats and names several things). From my talk box to my ebow. They open up creative possibilities. Sheer bloody-mindedness. Playing guitar has been driven solely by me. I was given violin lessons. I was given piano lessons. I taught myself to play guitar and it is the one instrument I can actually play! Without community I’m nothing. The small community that is the band enable me to play. I’m pretty pants at playing on my own. I like a drummer and bass player to riff off. I’m no use at all in a guitar shop as I’m not one of those “legend in your own bedroom” guys who’s gig is going to “the guitar shop”. Then there is all of Silverthorn’s fans. There is something about the energy of a crowd. They can will you to play out of your skin or they can make you want to cut a couple of songs and go home. Without community you may as well buy a CD. I suspect there will be a lot of song writing and learning new material as our keyboard player wants paternity leave =D That may actually be the incentive that I need to work out how to use the home recording studio I’ve built but not got around to using! !